What Do I Do for a Presentation/Assembly? 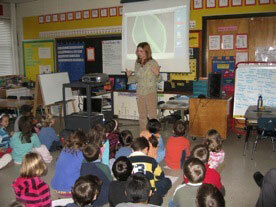 My School Visits are energetic, interactive, multi-media experiences for kids like no other author visit they have seen. My large group presentation is a virtual studio tour, through a projected DVD of me working on a real book, showing step-by-step, the actual process involved in taking a picture book from idea to finished product. I follow this up with a slide show that lets kids get to know me, reinforces the ideas they just learned about and is presented in a way that is interesting, fun, educational, and appropriate for all elementary grade levels; kids and grown ups alike will leave with a smile on their faces! For a complete description, download my Information Packet.